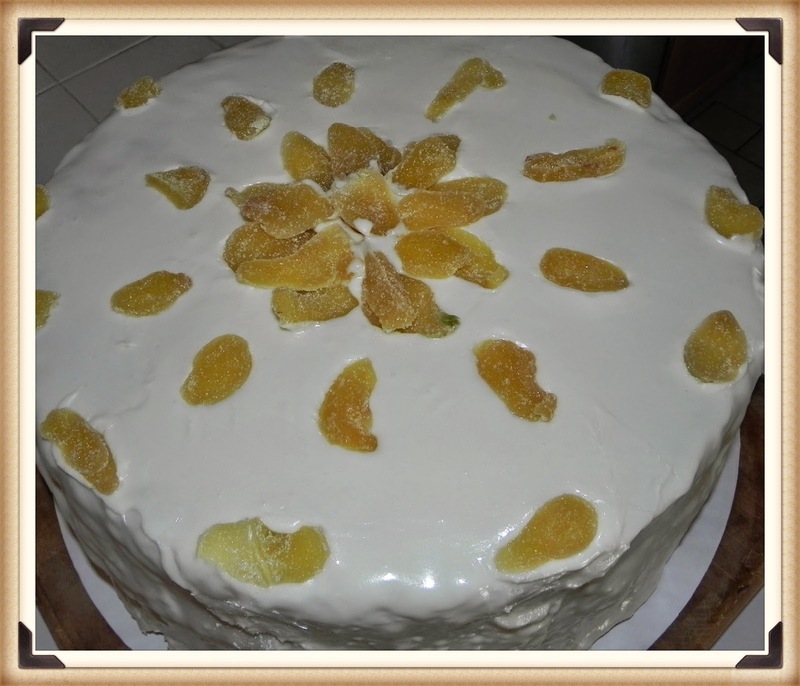 Finished cake decorated with crystallized ginger. The recipe below for a "Great Cake" was written down by Martha Washington's granddaughter, Martha Parke Custis. Great Cakes were quite large and tended to include an array of expensive ingredients such as candied fruits, rosewater, sherry, brandy, and spices. They were also quite large so the quantities of butter, sugar, eggs, and flour would have indeed been "great." When covered in marzipan and royal icing, this cake can weigh well above 12 pounds! Usually, great cakes were more bread-like as they included yeast in the form of ale-barm. As a matter of fact, most of Martha Washington's recipes for Great Cakes do include the barm. However, this recipe does not have any leavening agent other than eggs. The texture of this cake is therefore more cake-like than traditional Great Cakes but still very rich and filling--a small piece goes a long way. Great Cakes were often made for the Christmas holidays which could last well into Twelfth Night in January, being served at a ball for the occasion. I have made several of these cakes over the years for events at Riversdale House Museum, including their Christmas open houses and Twelfth Night balls. The c. 1801 Riversdale House Museum is located in Riverdale Park, Maryland and was the home of George Calvert and his wife, Rosalie Stier Calvert. It is particularly fitting that this cake be served at Riversdale House Museum because George Calvert's sister, Eleanor, was married to John Parke Custis and was the mother to Martha Parke Custis! 1. Heat oven to 350 degrees. Grease and line a 10" round cake pan with removable bottom or two 9" round cake pans. Place cake pan(s) on a parchment-lined baking tin. 2. In a medium bowl, measure out all but 1/2 cups of the flour. 3. Add the spices to the 3 1/2 cups flour and whisk until well incorporated and fluffy. 6. In a large mixing bowl, beat the butter and sugar together using an electric mixer. Optional: You can wrap sherry-soaked cheesecloth around the cake and store it for several weeks in an air-tight container. Optional: Cover the entire cake with rolled-out marzipan, using warm apple jelly as an adhesive. Then, coat the cake with Royal icing and allow to dry 10-12 hours. 1. Karen Hess, ed. Martha Washington's Booke of Cookery. New York: Columbia University Press, 1995.